When my sisters and I were kids, we'd look through stacks of coloring books trying to find one that had decent animals. You know the ones I mean - where the zebra's stripes when the REAL way, where the yaks didn't have big eyes and human lips on it and the horses did not resemble Gumby's mount Pokey. Whenever I complained about the lack of good coloring books, my mother told me I'd have to learn to make the good ones myself someday so that I'd save other kids from our fate. And if I couldn't work at Disney (ever since watching a Behind the Scenes look at Aladdin promo, my goal in my young life had been to BE a Disney Artist) I decided I would still make those coloring books. So I did. First for friends and family - and it was a wonderful experience! My God-sent family and friends were there every step - from encouragement, to printing and even the hand-binding. This year's coloring book was looooong in the making, but -- GET READY -- IT'S HERE!!! It's a book I would have traded a sister or two for when I was a kid *grin*. (Boy, I hope my sisters don't read this page). There are 16 pages (not including the colorable cover) and it is available in recycled newsprint or heavyweight cardstock. The newsprint is good for crayon, the cardstock is good for light watercolor, tempra, or acrylic paint, colored pencil, non-bleed marker, or crayon. $8 ($7 for the book plus $1 for shipping) and arrives within 10-14 business days. This item is available in our Online store. 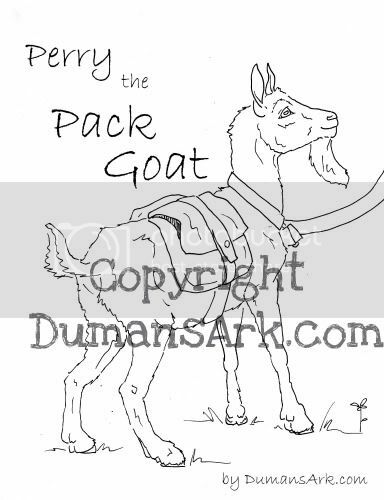 Perry the Pack Goat's coloring book is available for sale! Read Perry's story and color him as he grows and learns to Pack. This book is 9 recycled newsprint pages and a back and front cover of heavy cardstock. $4 plus $1.88 shipping and handling. 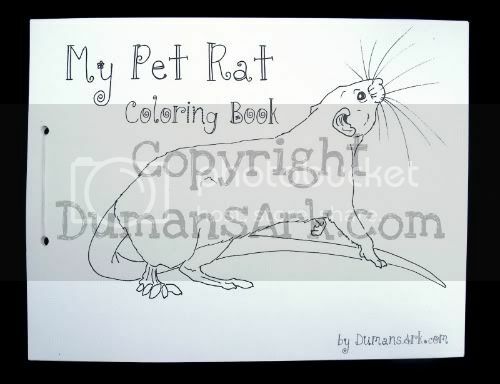 This coloring book features a Biblical verse that mentions the animal, and an illustration of that creature. Currently the verses are a collection of Kings James Version (KJV) and New International Versions (NIV). However, study is being done to collect KJV verses only. I will post the KJV versed book as soon as it is completed. NIV & KJV book is 26 recycled newsprint pages and a back and front cover of heavy cardstock. $10 plus $3 shipping and handling.